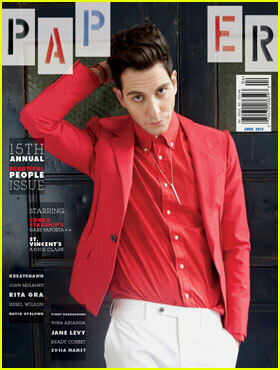 Gabe Saporta rocks a red shirt and jacket on the cover of Paper magazine’s 15th annual Beautiful People Issue. Also pictured inside: Paper‘s other Beautiful People Issue cover featuring indie singer Annie Clark aka St. Vincent! Leighton Meester and Mia Wasikowska attend the premiere of Miu Miu‘s The Woman Dress on Tuesday (February 14) at Cleveland Place in NYC. The movie is the third installment in a series of short films created by female filmmakers exploring women’s love affair with the Italian fashion house. Mia wore a navy silk taffeta key-hole dress and heels both by Miu Miu, while Leighton stepped out in a deep-v dress, heels, and red spazzolato bag by Prada. Also in attendance: Channing Tatum and wife Jenna Dewan; Kate Mara and boyfriend Max Minghella; and designer Erin Fetherston with her beau, Cobra Starship‘s Gabe Saporta! FYI: Leighton is wearing David Yurman jewelry. Ashlee Simpson and Vincent Piazza attend Samsung’s Fashion Take Note Studio Valentine’s Day Party held at Dream Downtown on Tuesday (February 14) in New York City. The 27-year-old entertainer and her actor beau were all smiles at the event hosted by Rag & Bone featuring a performance by the Band Of Horses. Also pictured: Jared Leto, Joe Jonas, Bridesmaids actress Rose Byrne, stylist Brad Goreski, and Gabe Saporta with his fashion designer girlfriend Erin Fetherston. FYI: Ashlee is wearing alice + olivia by Stacey Bendet and carrying an Edie Parker clutch. Nina Dobrev is stunning in Jenny Packham at the Nylon Magazine and got2b cocktail party to celebrate February’s issue at Mondrian Soho on Saturday (February 11) in New York City. The 23-year-old actress was joined by pals Kellan Lutz, Shenae Grimes, and Shay Mitchell, along with Nylon Editor-at-Large Dani Stahl and Kelly Bensimon for the bash. The next day, Kellan hit up the Simon Spurr Fall 2012 fashion show for New York Fashion Week at Milk Studios in NYC. Kellan met up with Joe Jonas, Gabe Saporta, and The Walking Dead‘s Norman Reedus. FYI: Nina is wearing Aldo booties. Bradley Cooper & Kellan Lutz: Tommy Hilfiger Twosome! Bradley Cooper and Kellan Lutz pose for a picture at the Tommy Hilfiger Men’s Fall 2012 fashion show held at the Park Avenue Armory on Friday (February 10) in New York City. Bradley, 37, and Kellan, 26, were joined for the NY Fashion Week presentation by designer Tommy Hilfiger himself! Also posing for pics were Gabe Saporta, Brad Goreski, and New York Giants football player Victor Cruz. “@TommyHilfiger blown away by the Tommy Hilfiger show! Loved every bit of it! Genius.” Kellan wrote on his Twitter account after the show! Ed Westwick attends the Simon Spurr Spring 2012 show during Mercedes-Benz Fashion Week at Milk Studios on Sunday (September 11) in NYC. The 24-year-old Gossip Girl actor checked out the designer’s latest collection, along with Gabe Saporta (who brought along his fashion designer girlfriend Erin Fetherston), stylist Brad Goreski, and How to Make It in America actor Bryan Greenberg. Ed recently hit the U.S. Open with his brother, where he watched a tennis match from the Lacoste suite and had some Earl Grey tea with fried chicken, People reports.